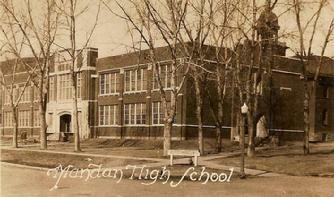 Activity started in 1899 when the Mandan Board of Education set out to identify a suitable location and convince the voters to invest $15,000 ($450,000 in 2016$) for a new "Central School" to house the junior and senior high students as well as provide a new larger grade school for west part of the city. The site selected was a 5 acre site located along the south foot of the bluff which spanned the north edge of the city. The city was expected to grow north out from Main Street away from the railyard. The voters approved. Eventually, a bell for the Central School was purchased by the school's alumni from a forge in Northfield, Michigan. The massive 380-pound solid bronze bell was installed in the bell copula in 1914. Over the years, more buildings were added to the site. 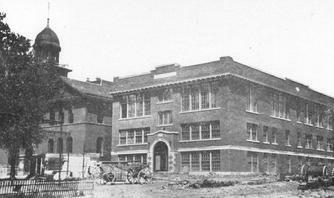 The first addition occurred in 1911 with the addition of new high school on the west edge of the lot. A new gymnasium was added in 1919. The three-story brick "Central School" is the only building of a total of five built over the years at the site to be demolished. In 1934, high school classes were transferred to a larger high school building designed in the Tudor / Gothic style popular at the time for education buildings. It is this building which today serves as the main entrance to the complex. Gilbert Horton, originally from St. Paul, Minnesota relocated to Jamestown in 1911 and eventually designed 254 different school buildings in North Dakota. The new high school was constructed infront of the Central School. The east-side building was then re-purposed as the junior high school. And the additional space in the Central School building was assigned to the grade school. 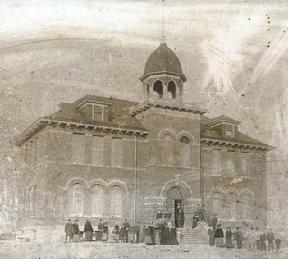 The bell remained in the Central School cupola bell tower until the building was demolished in 1966 after the completion of the current Mandan Senior High School building and the classroom assignments were shuffled. The three-story east-side brick building became a grade school after relinquishing its role as Junior High School to the 1934 era former Senior High. In June 1966, the bell was relocated to a special pedestal outside in its front plaza. The bell was then removed when the building was sold to a private investor. In 2012, the school district sold the property to GPA LLC, led by Yegen Development. Yegen later donated the property to Spirit of Life Catholic Church after an attempted redevelopment project was unsuccessful. A project to renovate the building into 39-unit affordable housing project was taken up by the Commonwealth Development Corporation. The housing project will include eight three-bedroom units, 28 two-bedroom units and three one-bedroom units. Ancillary amenities include a wellness center, chapel, community room, outdoor playground and green space plus off-street parking. The project also received funding from the North Dakota Housing Finance Agency. On August 2, 2017, the State Historical Society of North Dakota announced the complex that once housed an elementary, middle and high school respectively, was placed on the National Register of Historic Places. Buildings, sites or structures that are placed on the registry are part of a national program that identifies, evaluates and protects America's architectural resources. The housing project now qualifies for additional tax-credits for renovation of the buildings.